I love my new watch! It's big and chunky and fits me a little too loose but it would be tighter than I wanted if I took a link out. They made it where you can take a link out easily if you wish. The dial is big and easy to read but the smaller dials are hard to read. Smaller dials show 24 hrs, day date (very hard to read), and day of week. This watch is definitely different. I like that it's all chunky and makes a fashion statement! 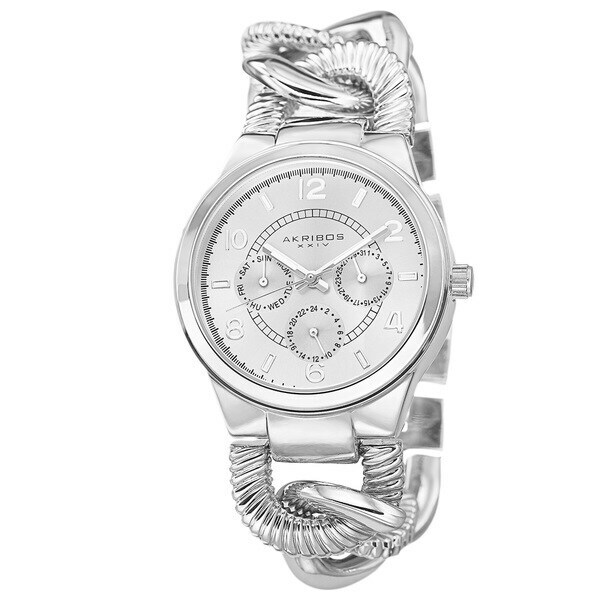 Add some style to any ensemble with this elegant bracelet watch from the creators of Akribos XXIV. The subdials feature the day date and GMT. Its intricate bracelet and luminous markers and hands result in a clean style that fits casual and modern outfits. I wanted a big chunky silver watch and this watch fits everyone of those. The face is very nice with all the dials. This comes in a beautiful brown box also. Bling is what you get in this power time pièce. Unique one of a kind design band creates two pieces in one. Chunky bracelet with textured links that sprakle every moment the light dances with. Eligent affair, business staff meeting or girls night this watch statement is heard. You are an accomplished lady who has attained prestige and posse uniqueness. A driving determinated that seperate the who's hot from the who's not. Beauty and strength can be achieved and will compliment your sixth sense. It is that which enables you to stand out in a crowd. Fashion a time piece that is worthy of your one of a kind attitude. Rock on Doll, a cut above that allows you to express that fearless CONFIDENT WOMAN others can only admire. I like this bracelet alot. Very fashionable. I like that they give you an additional link just in case you need more room. My only complaint would be that I had an issue with unclamping the link. Other than that, I give it a thumbs up. Very nice bracelet watch. Wears well. returning this watch chain too big and didn't fit right. This is a beautiful watch. It is just too large. I was expecting something much smaller. It's kind of like wearing a wall clock on my arm. Bought this for my mother in law. She won't stop telling me how much she love it! Cheap! Broke the first time I wore it! "Does this watch come with a battery? Does not work"
I love silver and things that are different. The braided band is not something I have ever saw so that and the price. "does this watch on a battery"
Hello judith p., the movement for this watch is Japanese Quartz which is powered by a battery. Please let us know if you have additional questions. Thanks for shopping with us.